Fort Worth, Texas – Dale Earnhardt Jr. went on vacation last weekend promising to “raise a little hell.” What could it hurt? Considering Junior’s lackluster start to the 2009 Sprint Cup season, perhaps some sort of personal exorcism was in order for NASCAR’s most scrutinized star. “I don’t know. You tell me,” Junior joked before exiting Texas Motor Speedway. Junior started and finished 20th in the Samsung 500, one lap down to Hendrick Motorsports teammate and race-winner Jeff Gordon. A four-time series champion, Gordon scored his first victory on TMS’ 1.5-mile quadoval in his 17th attempt and also ended a career-worst 47-race winless streak. He was followed across the finish line by Hendrick teammate Jimmie Johnson, the three-time/reigning series champion. Earlier in the weekend, Junior detailed the mounting frustration he and embattled crew chief Tony Eury Jr. continue to experience with NASCAR’s Car of Today. Heading to Phoenix International Raceway for the Subway Fresh Fit 500 on Saturday night, Junior strongly suggested that he and his cousin need to re-invent their game plan for the typical race weekend. And that begins with qualifying. For the record, Junior’s average qualifying position this season is 24.7; his average finishing position is 18.4. In comparison, Gordon’s average starting position is 9.4 and his average finishing position is 4.7. For Johnson, the numbers are 5.7 and 11.2, respectively. Junior’s most recent pole? April 4, 2008 at TMS…36 races ago. He has started no higher than 14th, and that was via a qualifying race at Daytona International Speedway. Dale Jr.’s stats to-date are consistent in their mediocrity – zero poles, zero wins, zero top-fives and two top-10s, highlighted by an eighth-place finish at Martinsville Speedway. When he led Laps 253-258 at TMS, it marked only the second time Junior had raced from the point in 2009. Including the circuit he paced in the season-opening Daytona 500, Junior now has a total of seven laps-led. 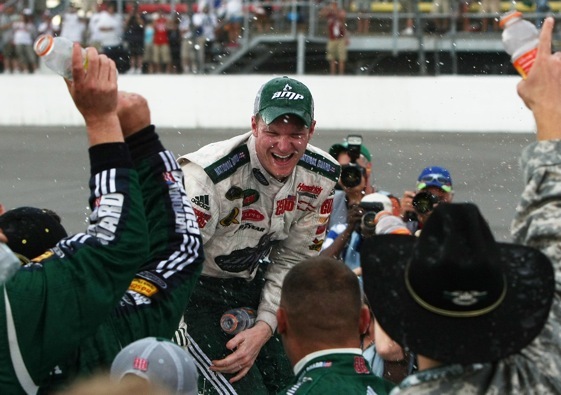 His 17th and most recent career victory, and only Cup win since beginning his tenure with HMS last year, was scored at Michigan Speedway on June 15. That was 28 races ago. It only feels like forever to Junior Nation. This is where Junior has a problem with NASCAR’s approach to the COT, the boxier, less-aerodynamically dependent silhouette which made its debut with a limited, 10-race schedule in 2007. Junior noted that among the ideas being offered to create that elusive ”better racing” are increased front downforce, additional horsepower and/or bigger tires. “Everybody has such a different opinion about it that you can’t get agreement to start being more productive…toward having the most competitive and exciting racing we can have,” Junior said. “I would guarantee you that there’s not a driver or a guy that works with NASCAR that wouldn’t like the racing to be better. We all would. Meanwhile, Junior said the now infamous “milk and cookies” meeting team-owner Rick Hendrick called on March 25, four days before the No. 88 finished eighth at Martinsville, was a revelation. Among those offering opinions on the performances of Dale Jr. and Eury Jr. were Ken Howes, HMS’ vicepresident of competition; Brian Whitsell, team manager, and Doug Duchardt, vice president of development. Hendrick emerged from that mid-week session to say he is “100 percent behind” Junior’s current group. “I have no intentions of making any changes,” Hendrick said. “I have all intentions of making it better. And I’ve got to believe in the next few weeks we are going to see some real success out of that crowd.” Dating to Geoffrey Bodine’s victory at Martinsville Speedway 25 years ago, Hendrick’s drivers have won eight Cup championships and 176 races. But again, only one by Dale Earnhardt Jr.
Hendrick reiterated that he believes Junior has embraced the constructive criticism, and intends to run with it…up front. “I just wanted them to tell me their real thoughts and give it to me,” said Junior, whose candor has added to his status as NASCAR’s Most Popular Driver for six consecutive seasons. Anyone want to bet jr. doesn’t win another race with tony jr. in his pits? You can qualifier #1 every week, but heading to the rear due to errors in the pits nullifies any time spent working on qualifying. Jr obviously has trouble seeing the pit board. Surely, someone at HMS can be assigned to work on this problem. Does it take a rocket scientist to see that HMS is not spending the time to recruit and train qualified pit members for the #88? Saving (or not losing, even gaining) positions in the pits requires skill and coordination. The driver, crew chief and crew members share equally in this responsibility. Often, the #88 is a joke in this respect.